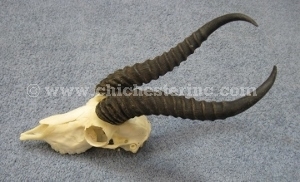 These real springbok skulls with horns measure approximately 9" to 12" around the curl of the horns. Note that they will vary in horn size, shade and shading, and may have imperfections. Our Gxx codes denote individual pieces. If you would like to order a specific springbok skull, please go to our Gallery to pick the exact one shown. Genus and species: Antidorcas marsupialis. Wild. Springbok are NOT endangered and are very common in southern Africa. They are often hunted for food. In fact, on my trips to South Africa I usually enjoy springbok steaks at a variety of restaurants.